Records suggest Champlain died on Christmas Day in 1635, and his remains were moved to a chapel that was later burned to the ground. A Jesuit text from 1642 refers to a priest who was buried alongside the founder and another friend, but there is no record of where that burial took place. “It is likely the remains were moved, but nobody knows when or where,” Mr. Lavoie said. Serious efforts to find the tomb began in the mid-1800s. Scientists began “digging left and right” to find Champlain, he said, but without success. More recently, an archaeologist who shared the name of former Quebec premier Rene Levesque led a series of digs in the 1980s and 1990s that proved equally fruitless. Mr. Lavoie believes the location of the original “Champlain chapel” to which his remains were moved has been found in the old city. Mr. Lavoie believes there’s a good chance Champlain could be lying somewhere beneath Quebec City’s basilica, either on his own or in a common grave. But the search for the founder’s remains are at a standstill, and even if found, they would not be easy to identify. Champlain fathered no children and left no descendants, which eliminates the possibility of DNA matching. To confirm the identity, researchers would have to match up remains with what little that is known about Champlain physically — for example traces of the arrow wounds he suffered during a 1613 conflict with the Iroquois. 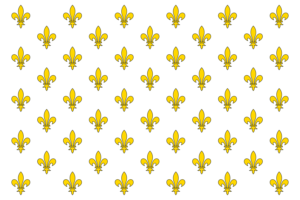 Champlain was a Protestant, was he not? And the prevailing theory for many decades has been that he and other Protestants were buried apart from later cemeteries (and therefore, not under the Basilica). If anything his remains have for a very long time thought to be buried under the Anglican cathedral, either the car park or the outbuildings. He belonged to either a Protestant family, or a tolerant Roman Catholic one, since [Champlain’s birthplace of] Brouage was most of the time a Catholic city in a Protestant region, and his Old Testament first name (Samuel) was not usually given to Catholic children. According to many modern historians… Champlain could have been born a Protestant. Professor [Alain] Laberge [of Laval University] suggested that Champlain’s Protestantism would have been downplayed or omitted from educational materials in Quebec by the Roman Catholic Church, which controlled Quebec‘s education system until 1962. 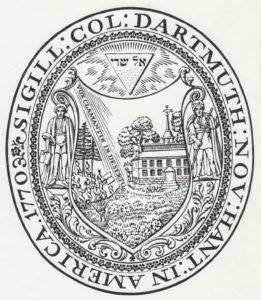 In November 1937 as America clawed its way out of The Great Depression, a Californian man showed up at the history department of Emory University in Atlanta with a most peculiar object – a 21-pound chunk of rough veined quartz with some foreign looking words chiseled into its surface. The man said he found the rock in a North Carolina swamp, about 80 miles from Roanoke Island, while he was driving through on vacation. 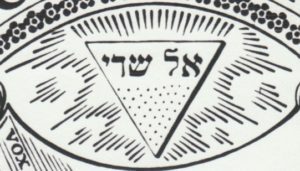 The strange stone caught the attention of one of the professors, Dr. Haywood Pearce Jr., who also served as vice president of Brenau, where his father was president. The inscription on the stone read “Ananias Dare & Virginia went hence unto heaven 1591,” and a message to notify John White of that news bore the initials of the author of the carved writing, EWD, presumably those of Eleanor Dare. Although Emory’s historians weren’t interested, Pearce and his father certainly were. Perhaps they concluded that, if this chuck of rock indeed marked the graves of America’s “first white child” and her father, it might well be the thing to put their college on the map. 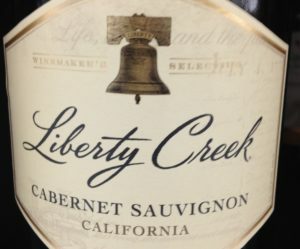 They wound up paying the California man $1,000 for the treasure. In the past few years, researchers have been taking another look. For one, the letters etched on the first stone look very different from the others. It doesn’t contain any suspiciously modern words as the others do. Plus, Dare was “moderately educated,” Schrader says, and her husband was a stonemason. It’s reasonable to think she may have learned the skill from him. In 2016, Schrader had a sample of the stone analyzed by the University of North Carolina at Asheville, exposing the quartz’s bright white interior. Schrader said he would like to marshal the funds for an “exhaustive, geochemical investigation,” but first, this fall, a Brenau professor will assemble a team of outside experts to analyze the language more thoroughly. “The type of English that’s on the stone was really only used for about a hundred years, so it’s a nice time marker to be able to study,” Schrader said. 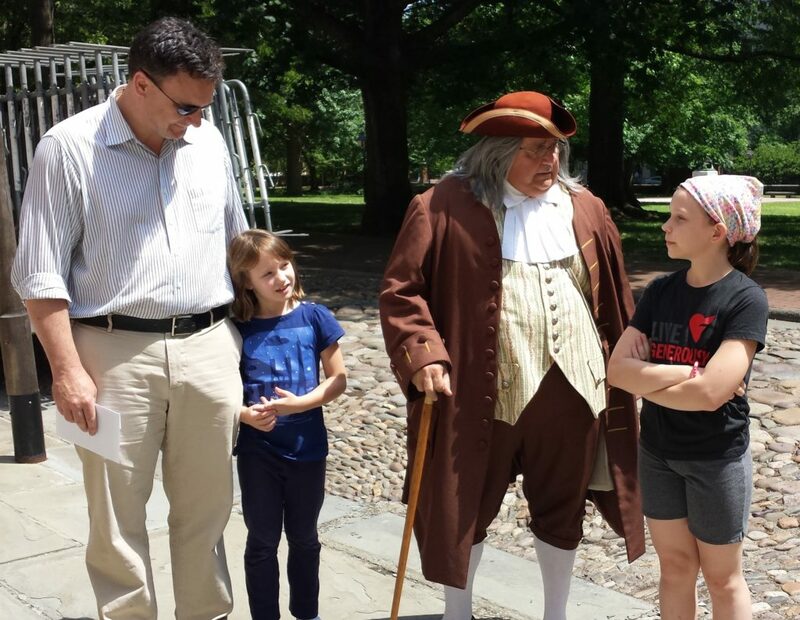 One of the interesting things we learned this summer in Philadelphia is that Benjamin Franklin lived in a common-law relationship with his wife Deborah Read, from 1730 until her death in 1774. Was this on account of Franklin’s principled unorthodoxy, the same spirit that impelled him to reject organized religion and to appear at the court of the French king wearing a rustic fur hat? Not really – it was simply that Read could not prove that her first husband was actually dead, and could thus not remarry without committing bigamy. Franklin and Read spent much time apart, however – allegedly she hated sea travel, and so did not accompany Franklin on his many trips to Europe. Another theory “suggests that a debate over the failed treatment of their son’s smallpox was the culprit.” See an extensive article in this month’s Smithsonian Magazine for more details. Franklin already had an illegitimate child by another relationship before he set up house with Read; this was William Franklin (d. 1813). William grew up to be the last colonial governor of New Jersey and interestingly, remained a steadfast loyalist during the Revolutionary War. He ended his days in London unreconciled to his father. • they take one day off per week, but it’s Sunday, not Saturday. • they use the Psalms in worship, but will often Christianize them by adding the Gloria Patri at the end of each one. • Easter, like Passover, is a moveable feast, but Christians have arranged things so that Easter is never on the same day as Passover. Some good ones from Ben Franklin. I pasted these Quotations from the Project Gutenberg e-text, which unfortunately does not preserve Franklin’s eighteenth-century Custom of capitalizing Nouns. • Not rational, but rationalizing! “There are croakers in every country, always boding its ruin. Such a one then lived in Philadelphia; a person of note, an elderly man, with a wise look and a very grave manner of speaking; his name was Samuel Mickle. This gentleman, a stranger to me, stopt one day at my door, and asked me if I was the young man who had lately opened a new printing-house. Being answered in the affirmative, he said he was sorry for me, because it was an expensive undertaking, and the expense would be lost; for Philadelphia was a sinking place, the people already half-bankrupts, or near being so; all appearances to the contrary, such as new buildings and the rise of rents, being to his certain knowledge fallacious; for they were, in fact, among the things that would soon ruin us. And he gave me such a detail of misfortunes now existing, or that were soon to exist, that he left me half melancholy. Had I known him before I engaged in this business, probably I never should have done it. This man continued to live in this decaying place, and to declaim in the same strain, refusing for many years to buy a house there, because all was going to destruction; and at last I had the pleasure of seeing him give five times as much for one as he might have bought it for when he first began his croaking. “Tho’ I seldom attended any public worship, I had still an opinion of its propriety, and of its utility when rightly conducted, and I regularly paid my annual subscription for the support of the only Presbyterian minister or meeting we had in Philadelphia. He us’d to visit me sometimes as a friend, and admonish me to attend his administrations, and I was now and then prevail’d on to do so, once for five Sundays successively. Had he been in my opinion a good preacher, perhaps I might have continued, notwithstanding the occasion I had for the Sunday’s leisure in my course of study; but his discourses were chiefly either polemic arguments, or explications of the peculiar doctrines of our sect, and were all to me very dry, uninteresting, and unedifying, since not a single moral principle was inculcated or enforc’d, their aim seeming to be rather to make us Presbyterians than good citizens. “I inquir’d concerning the Moravian marriages, whether the report was true that they were by lot. I was told that lots were us’d only in particular cases; that generally, when a young man found himself dispos’d to marry, he inform’d the elders of his class, who consulted the elder ladies that govern’d the young women. As these elders of the different sexes were well acquainted with the tempers and dispositions of their respective pupils, they could best judge what matches were suitable, and their judgments were generally acquiesc’d in; but if, for example, it should happen that two or three young women were found to be equally proper for the young man, the lot was then recurred to. I objected, if the matches are not made by the mutual choice of the parties, some of them may chance to be very unhappy. “And so they may,” answer’d my informer, “if you let the parties chuse for themselves;” which, indeed, I could not deny. Accordingly Mr. Hanbury called for me and took me in his carriage to that nobleman’s, who receiv’d me with great civility; and after some questions respecting the present state of affairs in America and discourse thereupon, he said to me: ‘You Americans have wrong ideas of the nature of your constitution; you contend that the king’s instructions to his governors are not laws, and think yourselves at liberty to regard or disregard them at your own discretion. But those instructions are not like the pocket instructions given to a minister going abroad, for regulating his conduct in some trifling point of ceremony. They are first drawn up by judges learned in the laws; they are then considered, debated, and perhaps amended in Council, after which they are signed by the king. They are then, so far as they relate to you, the law of the land, for the king is the Legislator of the Colonies.’ I told his lordship this was new doctrine to me. I had always understood from our charters that our laws were to be made by our Assemblies, to be presented indeed to the king for his royal assent, but that being once given the king could not repeal or alter them. And as the Assemblies could not make permanent laws without his assent, so neither could he make a law for them without theirs. He assur’d me I was totally mistaken. Obviously I would need to read others’ opinions of Franklin before coming to my own judgment of his character. But I quite like the image he presents of himself in his Autobiography. He is constantly striving for improvement, in himself and in the world around him, which is how he came up with all the inventions for which he is famous. He even lists thirteen virtues that he would like to cultivate in himself, and keeps a chart recording how he exercises each one on a daily basis, much as my kids get a chore chart on the fridge. (Not everyone acts this way, of course, but an unwillingness to accept the world as it is, and to seek to change it through work and ingenuity, seems a particularly American trait.) And yet through it all he never loses his wry sense of humor (which is not American, but something I certainly appreciate). You may have heard that Washington had wooden teeth. He lost most of his teeth in his twenties and had a set of dentures made out of wood. Except it isn’t true. In 2005, at the National Museum of Dentistry in Baltimore, laser scans were performed on Washington’s two-hundred-year old dentures, and found them to be made of gold, lead, hippopotamus ivory, horse, and donkey teeth. Upon learning this information, how did you feel about George Washington’s teeth? I stated a thing, I provided evidence of that thing, and presumably you now believe in the thing I stated. Presumably, your belief in the composition of George Washington’s teeth has changed with little or no friction. But what if I told you George Washington had another set of false teeth? What if I told you this other set wasn’t made from wood, ivory, or any of the aforementioned materials? Now, let’s try this again. How did it feel to learn this fact about George Washington? Any of the friction I mentioned earlier? You may have noticed that the first fact about George Washington’s teeth was rather easy to accept. But when I told you the second fact, you immediately checked my sources and are now furiously composing an informed-yet-incendiary retort which you will boldly deliver to me in the form of a sour, blustering Facebook comment. Matthew Inman, author of The Oatmeal, goes on to examine this so-called “backfire effect,” which occurs when we encounter beliefs that fundamentally challenge us and prompt our limbic system to respond as though we are being threatened with physical danger. This phenomenon deserves wider attention, if only to make people ashamed of it and encourage them to get over it, perhaps through Cognitive Behavioral Therapy. After all, we cannot have universities, devoted to the free pursuit and communication of ideas, if everyone is running around being “triggered” by ideas they disagree with, equating those ideas with “violence,” requiring “safe spaces” as protection from them and soothing expressions of parental concern from the university administration, who have better things to do. 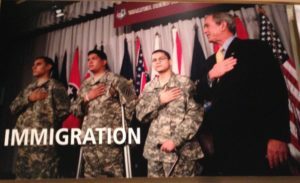 Alas, this fundamentally adolescent mode of behavior is becoming all the more common in American academia, doubtlessly because the anti-bullying movement has encouraged people to believe that any difficulty they encounter is not only unpleasant, but morally illegitimate (requiring “emotional labor” to overcome), because university staffers feel the need to justify their employment by “doing something” about whatever is brought to their attention, and because liberal academics are desperate to be seen as being on the correct side of things politically. details Washington’s purchase of 9 teeth from “Negroes” for 122 shillings. It’s not clear if Washington intended to use these teeth as implants or within a new set of dentures or if he employed the teeth at all. While this transaction might seem morbid to a modern audience, purchasing human teeth was a fairly common practice in the 18th century for affluent individuals. The only documentation of which we are aware of George Washington purchasing teeth from slaves is a brief notation in his ledger books. The physical evidence, a pair of Washington’s dentures that includes human teeth, is part of the collection at Mount Vernon. As to the circumstances surrounding the creation of these dentures, the best historians can do is make an educated guess. Like all historical theories, this conclusion should be grounded in historical context, supplemental primary and secondary documents, and sound reasoning. But without further documentation, it is impossible to describe the scenario in definitive terms. We are not even entirely positive that the teeth whose price is recorded in the Ledger Book are the same as those in the dentures. Lund Washington, George’s distant cousin who managed Mount Vernon during the Revolution, made a notation in the plantation ledger books for May 1784: “By Cash pd Negroes for 9 Teeth on Acct of Dr. Lemoire.” This “Dr. Lemoire” was almost certainly George Washington’s dentist, Dr. Jean Le Mayeur, who corresponded with George Washington about his visit to Mount Vernon that summer. Wherever Dr. Le Mayeur practiced, he sought out through newspaper ads “Persons who are willing to dispose of their Front Teeth.” While in New York, he advertised that he would pay two guineas each for good front teeth; in Richmond, he stipulated “slaves excepted.” That could explain why the price noted by Lund Washington was so low. Nine teeth sold for two guineas each would be worth almost nineteen pounds; Washington paid only slightly more than six pounds. Without further documentation, we can only speculate on the sequence of events leading to the inclusion of human teeth in George Washington’s dentures. Perhaps Dr. Le Mayeur offered George Washington a deal in which Washington saved on teeth by buying them at a much-discounted rate from his own slaves rather than from Dr. Le Mayeur. It is also possible that George or Lund Washington forced one or more of their enslaved people to part with their teeth, paying them a drastically reduced price. Under Virginia’s laws at the time, no plantation owner would have faced legal consequences for such an action. 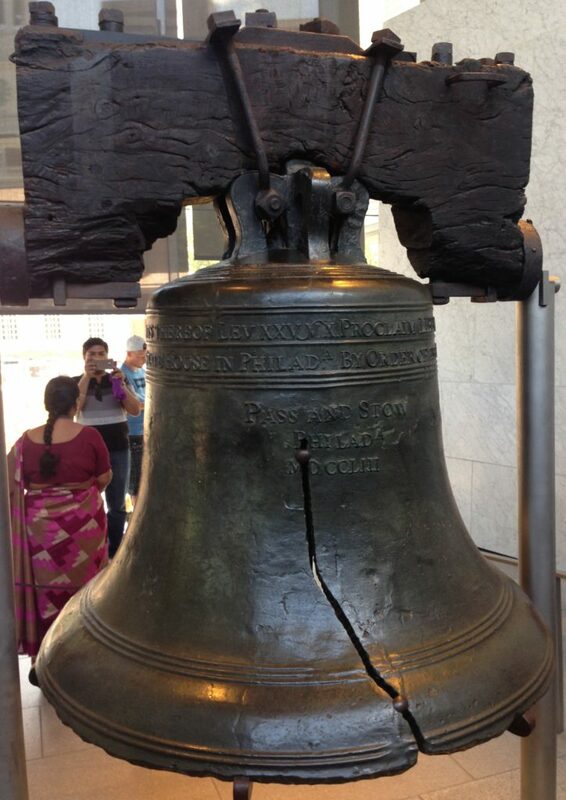 Happy to have experienced Philadelphia for the first time this summer. 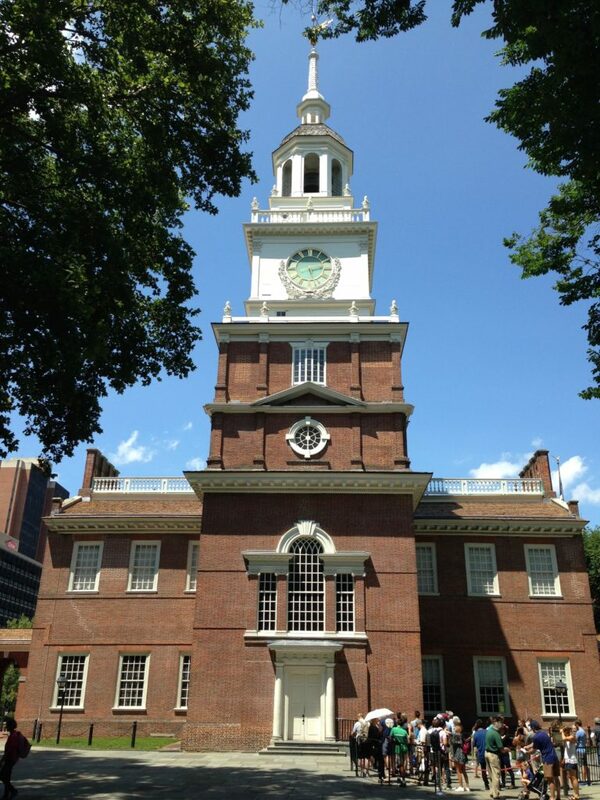 Unfortunately, we did not get to spend too much time there, but we did get to see the two biggest historical attractions: the Liberty Bell and Independence Hall. As a bonus we got to learn something about Benjamin Franklin. 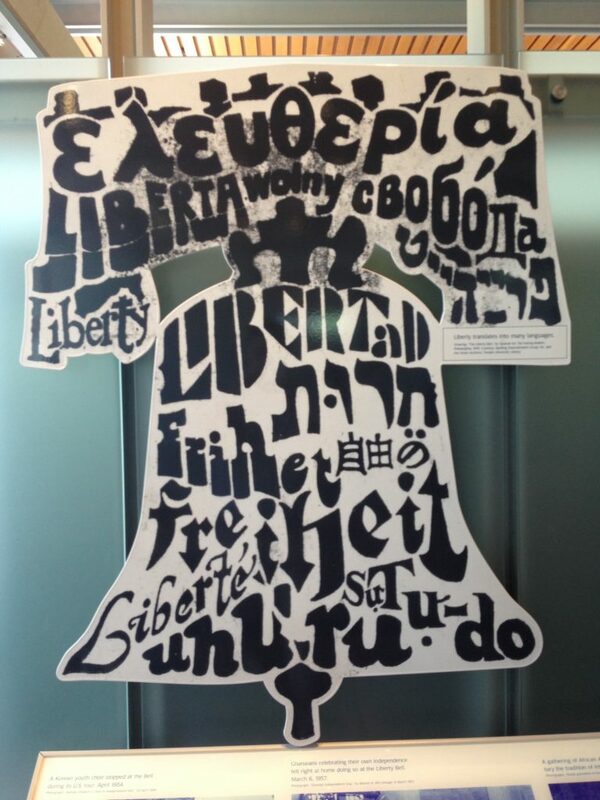 You get to see it in the Liberty Bell Center, run by the National Parks Service, located across the street from Independence Hall. 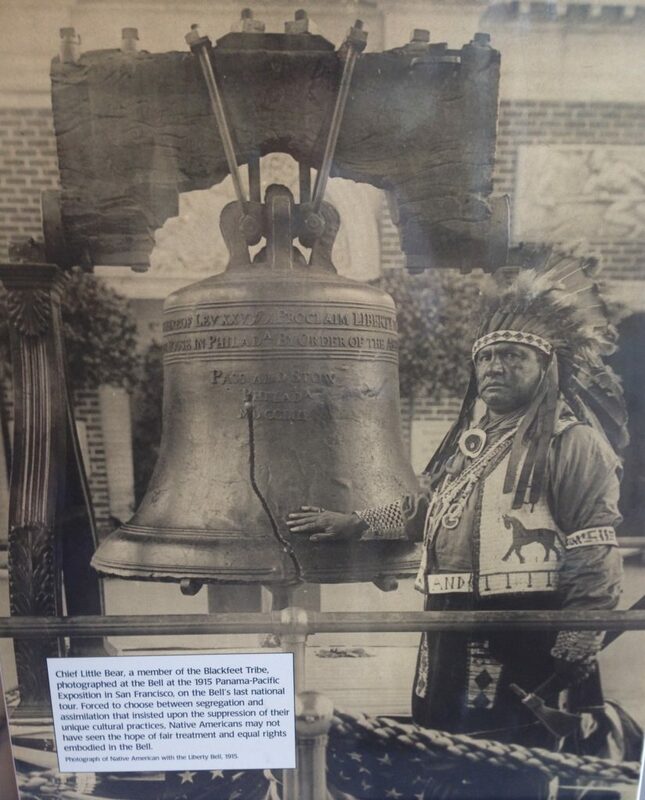 Annoyingly, you have to pass through an airport-level security checkpoint to get in, but the NPS does give you information about the object’s history and its place in the American psyche – it used to go on tour throughout the country, and in the nineteenth century became a symbol of the desire for liberty by African-Americans and women, in addition to being reproduced countless times in various media. 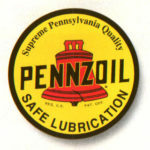 The building’s original function was as the seat of the colonial legislature of the Province of Pennsylvania. The first floor housed the supreme court on one side, and the legislative chamber on the other. It was in the latter of these that the Second Continental Congress adopted the Declaration of Independence (July 2, 1776), and members of the Constitutional Convention drafted the Constitution in the summer of 1787. 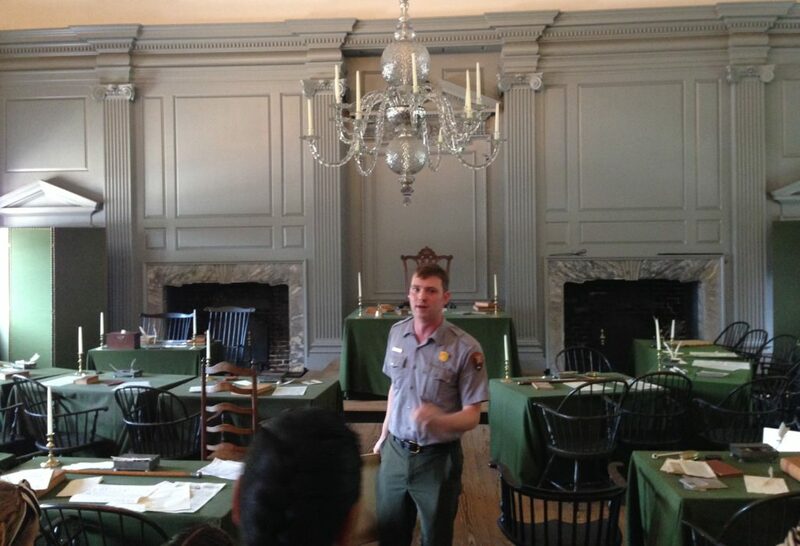 Our NPS interpreter (a recent Temple University BA in English) explains the room’s history. 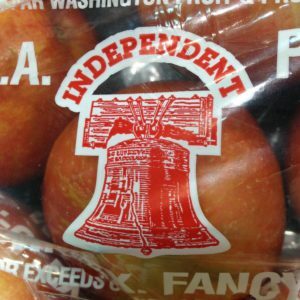 A fun fact: the Declaration of Independence was printed before it was handwritten. The representatives spent two days debating what exactly they were going to accuse George III of before sending it to the printer on July 4 (the reason that this date now marks Independence Day); they regathered in August to affix their signatures to a manuscript copy, which is now on display in the National Archives in DC. Walking down the street afterwards we were accosted by Ben Franklin (a.k.a. actor Rick Bravo), with whom we had a good chat. He enjoined us to visit his house further down the street. Not much of it still exists, although a “ghost house,” designed by architect Robert Venturi, now outlines where it once was, with concrete hoods that allow you to view the foundations of the original structure. 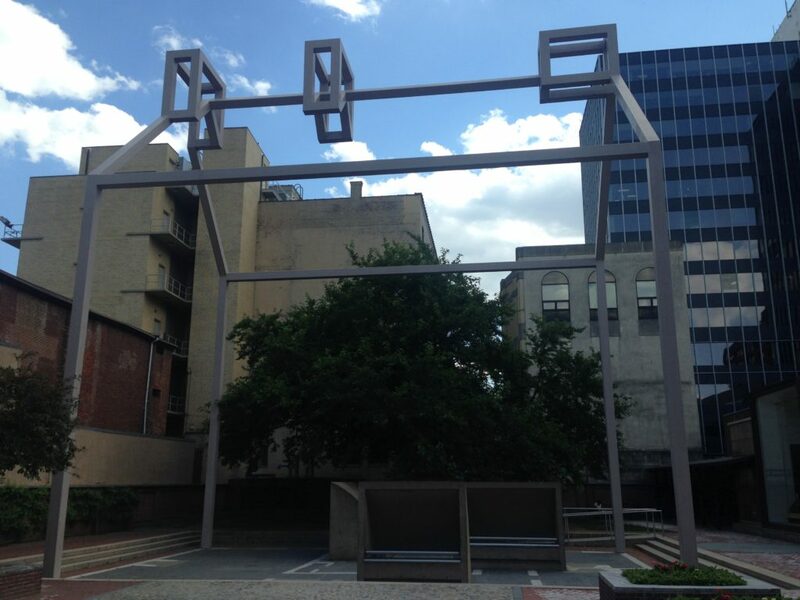 On the west side of this “Franklin Court” is the Benjamin Franklin Museum, a brutalist structure put up for the bicentennial in 1976. The National Parks Service has recently redone the exhibits, and they provide an informative and interactive view of Franklin’s career. To the north end of the court is a print shop (one of Franklin’s jobs was as a printer), where NPS employees will demonstrate the use of an eighteenth-century printing press. 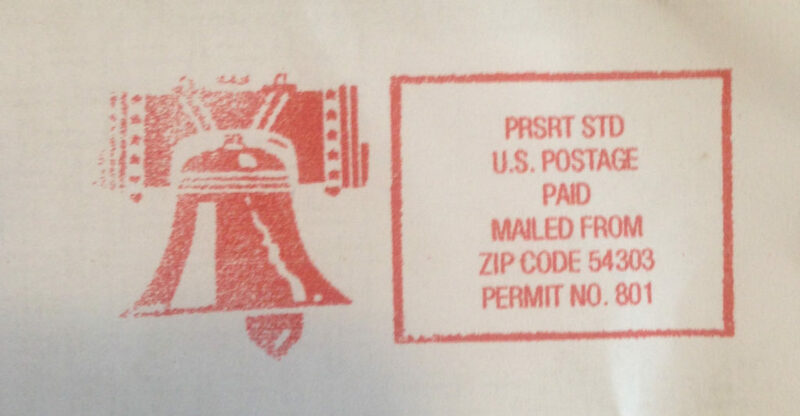 An adjacent working post office (Franklin served as the first Postmaster General) will allow you to send letters with specially designed cancellation marks. Benjamin Franklin’s Autobiography is now on my reading list for the summer. In 1701, in Middletown, New Jersey, Moses Butterworth languished in a jail, accused of piracy. Like many young men based in England or her colonies, he had joined a crew that sailed the Indian Ocean intent on plundering ships of the Muslim Mughal Empire. Throughout the 1690s, these pirates marauded vessels laden with gold, jewels, silk, and calico on pilgrimage toward Mecca. After achieving great success, many of these men sailed back into the Atlantic via Madagascar to the North American seaboard, where they quietly disembarked in Charleston, Philadelphia, New Jersey, New York City, Newport, and Boston, and made themselves at home. When Butterworth was captured, he admitted to authorities that he had served under the notorious Captain William Kidd, arriving with him in Boston before making his way to New Jersey. This would seem quite damning. Governor Andrew Hamilton and his entourage rushed to Monmouth County Court to quickly try Butterworth for his crimes. But the swashbuckling Butterworth was not without supporters. In a surprising turn of events, Samuel Willet, a local leader, sent a drummer, Thomas Johnson, to sound the alarm and gather a company of men armed with guns and clubs to attack the courthouse. One report estimated the crowd at over a hundred furious East Jersey residents. The shouts of the men, along with the “Drum beating,” made it impossible to examine Butterworth and ask him about his financial and social relationships with the local Monmouth gentry. Armed with clubs, locals Benjamin and Richard Borden freed Butterworth from the colonial authorities. “Commanding ye Kings peace to be keept,” the judge and sheriff drew their swords and injured both Bordens in the scuffle. Soon, however, the judge and sheriff were beaten back by the crowd, which succeeded in taking Butterworth away. The mob then seized Hamilton, his followers, and the sheriff, taking them prisoner in Butterworth’s place. Governor Hamilton had felt that his life was in danger. Had the Bordens been killed in the melee, he said, the mob would have murdered him. As it was, he was confined for four days until Butterworth was free and clear. Jailbreaks and riots in support of alleged pirates were common throughout the British Empire during the late seventeenth century. Local political leaders openly protected men who committed acts of piracy against powers that were nominally allied or at peace with England. In large part, these leaders were protecting their own hides: Colonists wanted to prevent depositions proving that they had harbored pirates or purchased their goods. Some of the instigators were fathers-in-law of pirates. There were less materialist reasons, too, why otherwise upstanding members of the community rebelled in support of sea marauders. Many colonists feared that crack-downs on piracy masked darker intentions to impose royal authority, set up admiralty courts without juries of one’s peers, or even force the establishment of the Anglican Church. Openly helping a pirate escape jail was also a way of protesting policies that interfered with the trade in bullion, slaves, and luxury items such as silk and calico from the Indian Ocean. Much more at the link. It’s interesting how such popular violence was a part of life in early America. As regular readers know, I am a great fan of heraldry, flags, and identifying emblems in general. 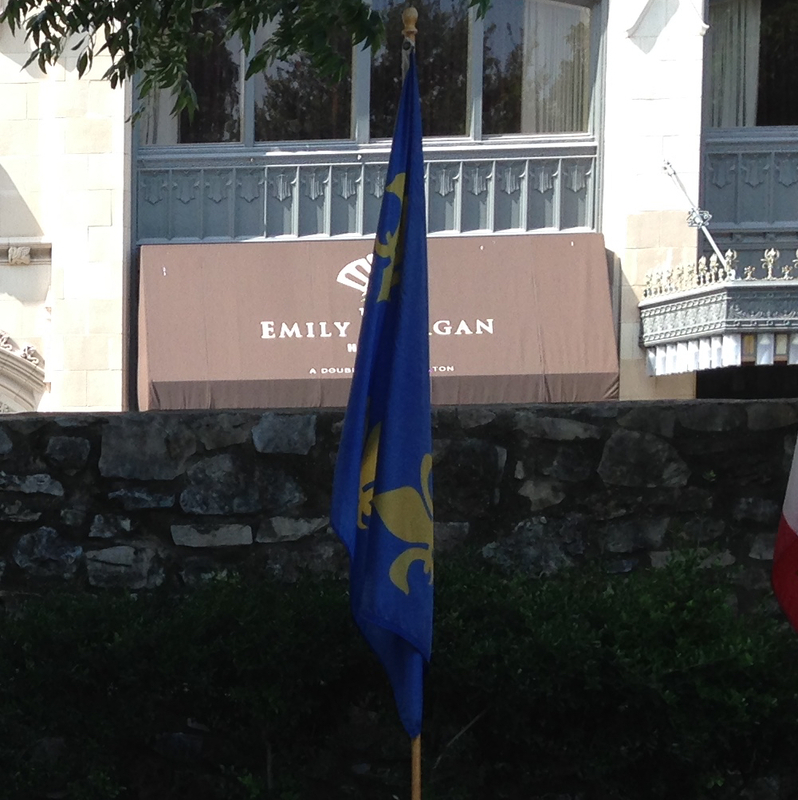 On a recent road trip from Georgia to Texas and back again, I was pleased to note a lot of historic flags in use. 1. 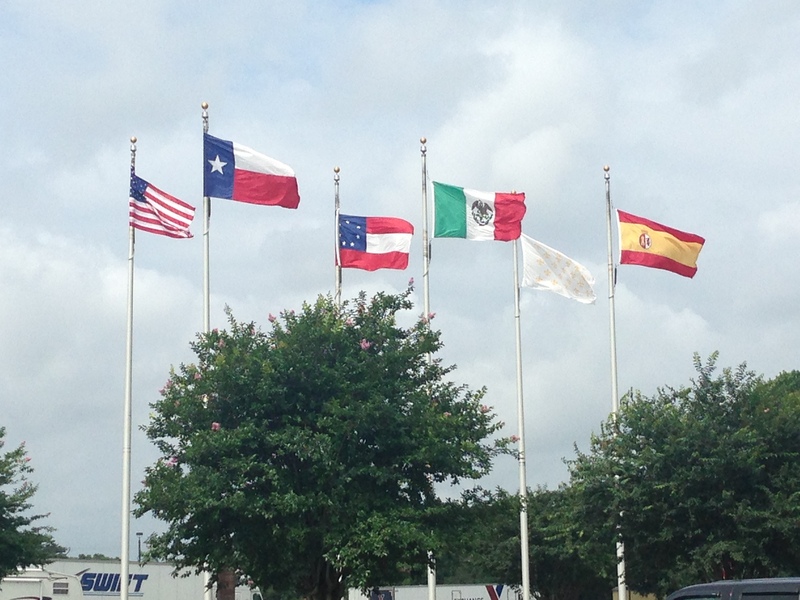 As we passed into Texas on I-10, we saw six flags flying at the Welcome Center, representing the six sovereign entities that have ruled Texas in the past. 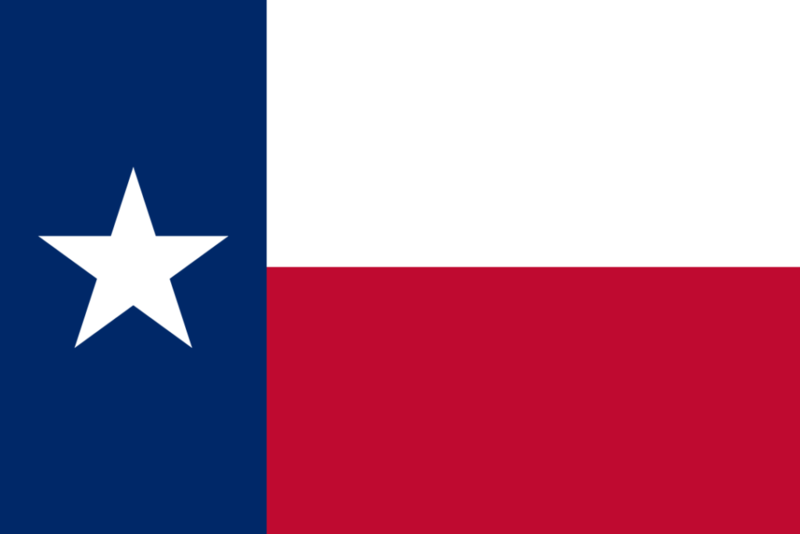 • Texas, of course, acted as its own country from 1836 to 1845, between its secession from Mexico and its joining the USA. 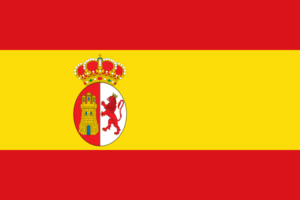 It retains this former national flag as its state flag. The design is wonderfully simple, even striking, and consequently flown quite a lot by Texans (including massive ones at car dealerships). This positively reinforces civic pride, as Roman Mars notes. 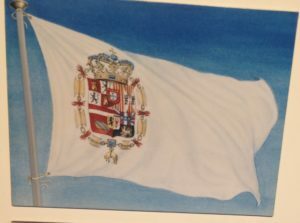 First national flag, CSA (Wikipedia). 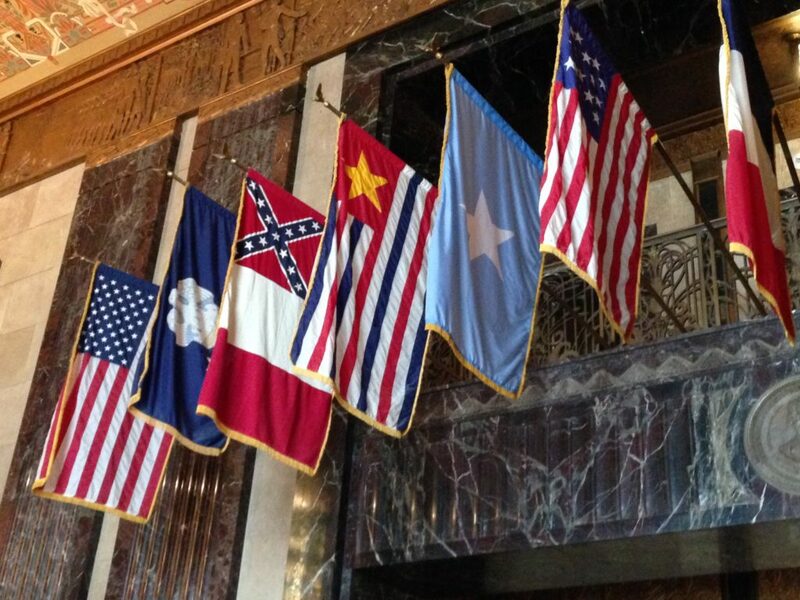 • The Confederate Flag flown is the first national flag with seven stars, which is appropriate as Texas was one of the original seven signatories to the CSA in early 1861. 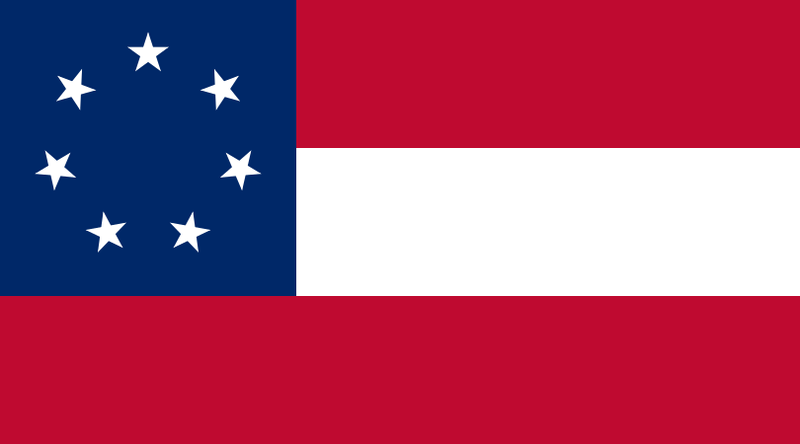 Displaying the Stars and Bars helps to avoid the appearance of the ever-controversial Confederate Battle Flag, which appears on the canton of the second and third national flags. 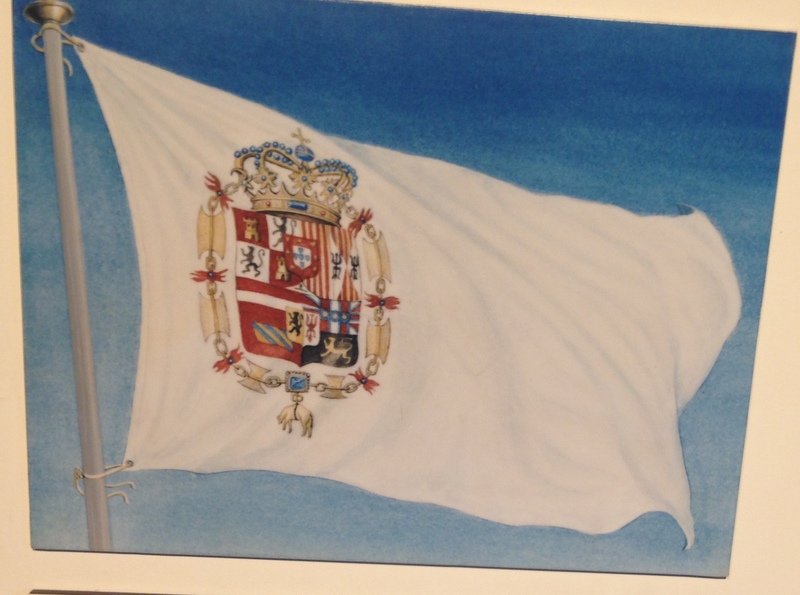 Second national flag, CSA (Wikipedia). 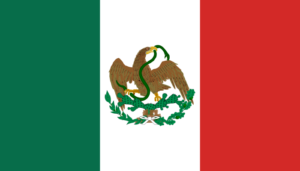 Third national flag, CSA (Wikipedia). Flag of the Mexican Republic, 1823-1864 (Wikipedia). 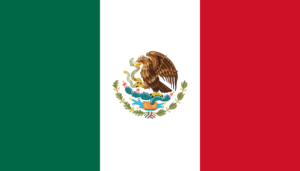 Flag of the United Mexican States, from 1968 (Wikipedia). I appreciate such attention to detail! 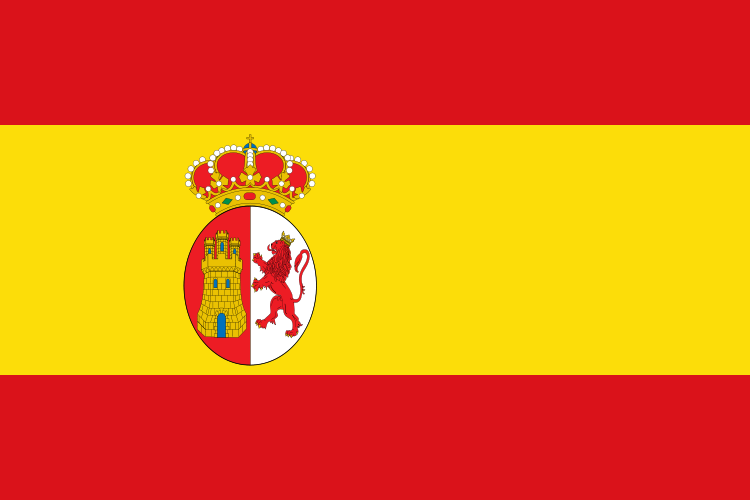 Ensign of Spain, 1785-1843 (Wikipedia). Outside the Bullock Texas State History Museum. 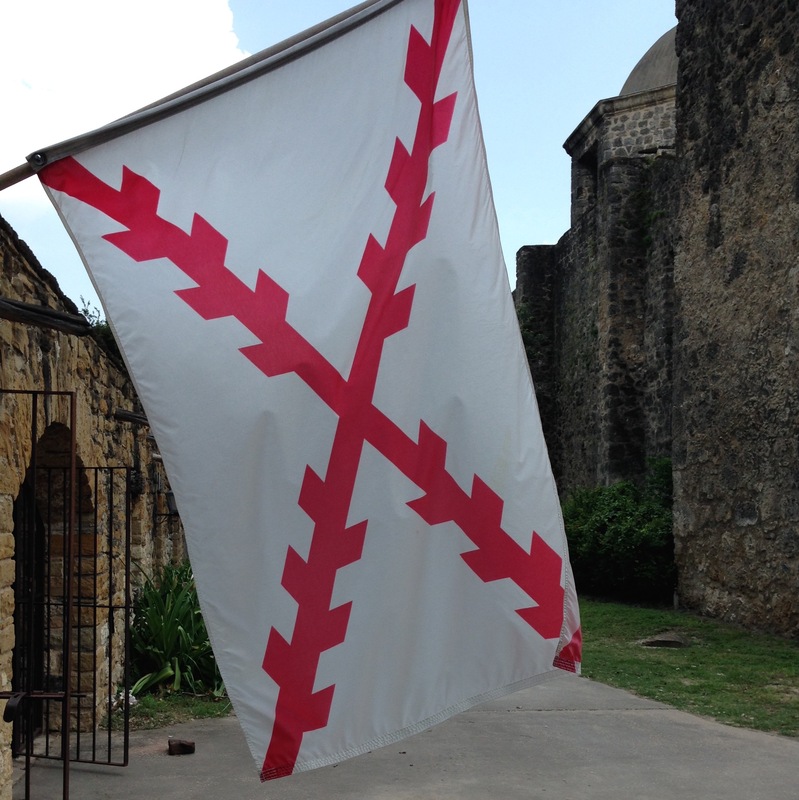 From a display at a Spanish mission in San Antonio. 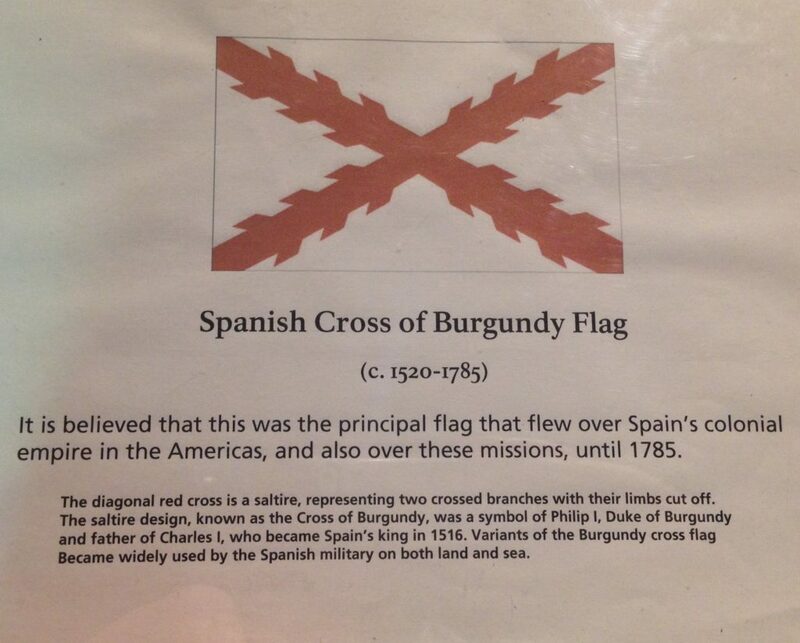 Or, best of all in my opinion, the Cross of Burgundy Flag. 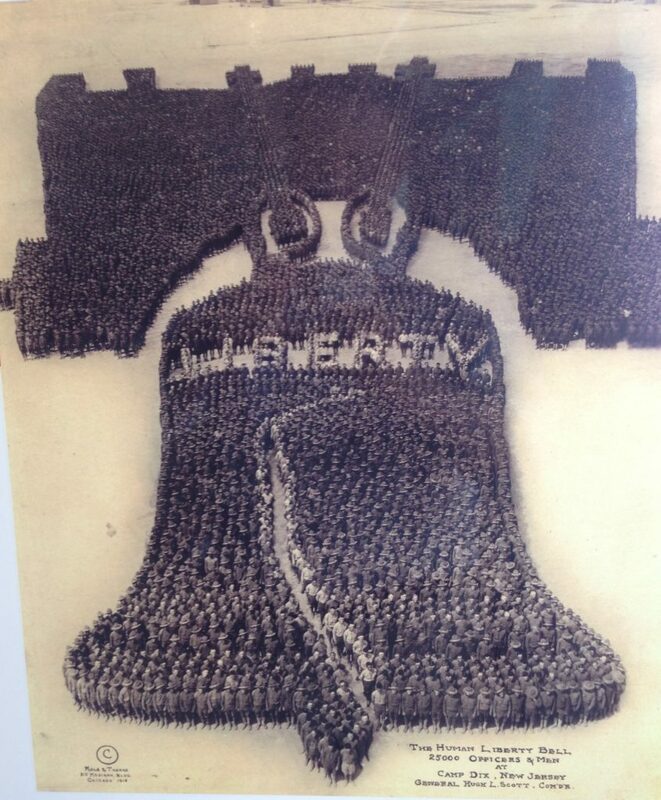 It’s simple, distinctive, and historically accurate. At Misión San José in San Antonio. From a display in Misión San Francisco de la Espada in San Antonio. 2. The Louisiana Welcome Center on I-10 flies two flags, the current Louisiana flag, and the Bonnie Blue Flag (apparently upside down!). 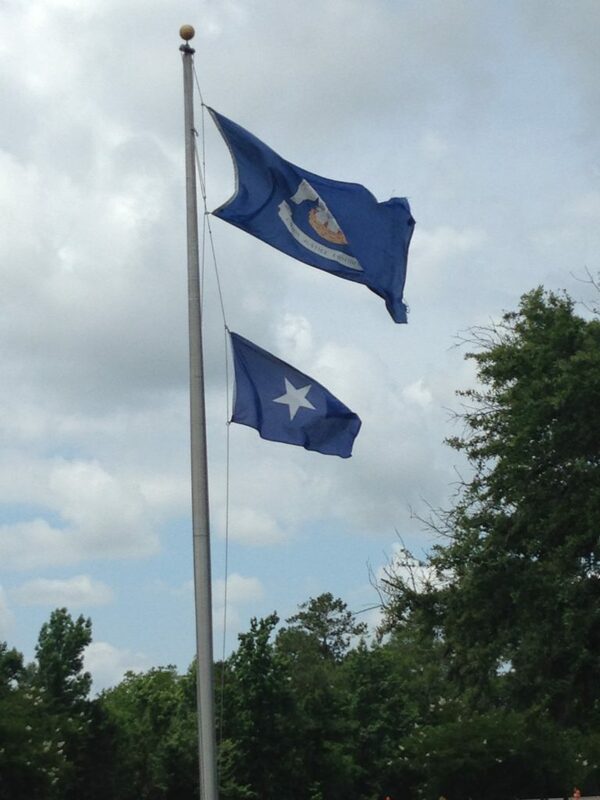 The Bonnie Blue Flag was used by some Confederates as an unofficial emblem; it is immortalized in a song. What people tend not to realize, however, is that this flag had been used earlier by Fulwar Skipwith’s breakaway Republic of West Florida for a few months in 1810, and the I-10 welcome center is in one of these so-called Florida Parishes. 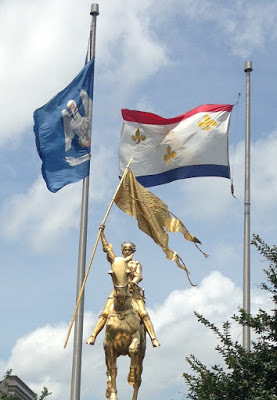 Interestingly, in the Louisiana State Capitol, the Bonnie Blue Flag is shown as light blue. 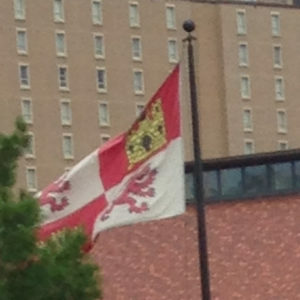 Apparently this was the actual shade of the flag of the Republic of West Florida. Thus, it appears that the RWF and Somalia have something in common. 3. 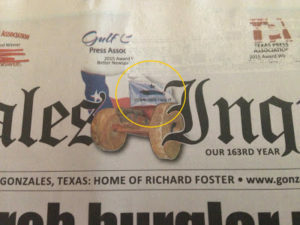 To the immediate left of the Bonnie Blue Flag in the photo above is a flag the reader has probably not seen before. 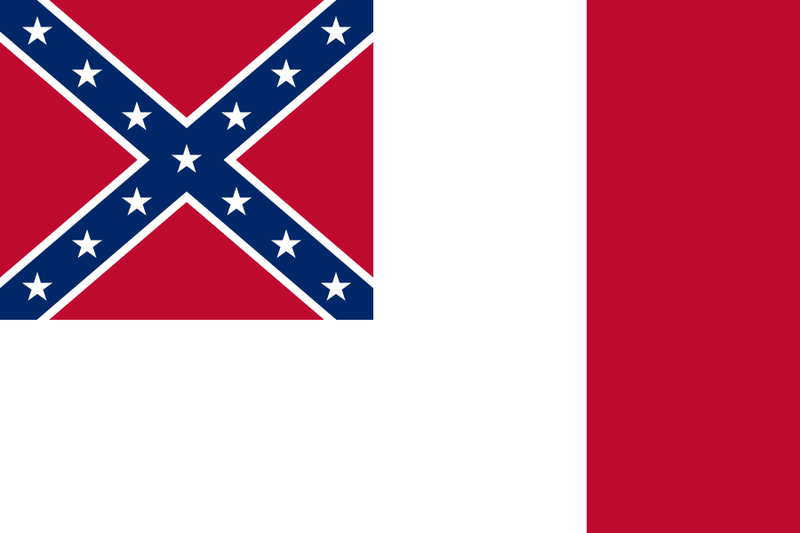 Flag of Louisiana, 1861 (Wikipedia). 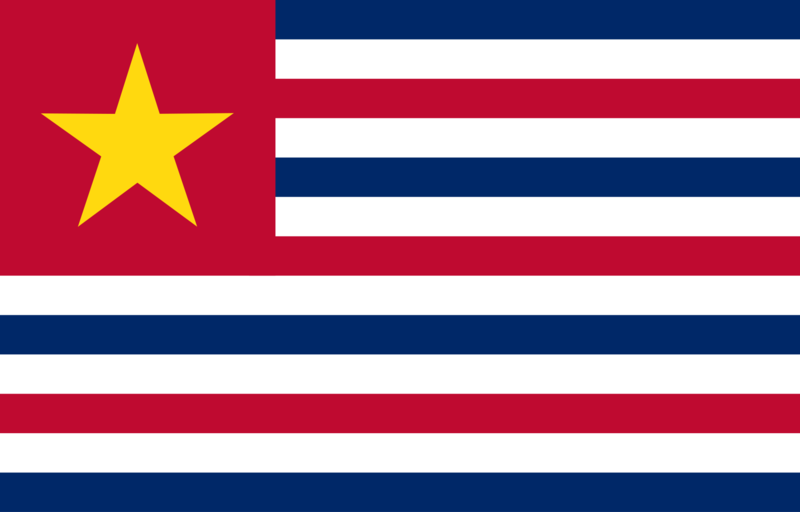 This is the flag flown by Louisiana between its secession from the Union, and its joining of the Confederacy, in 1861. 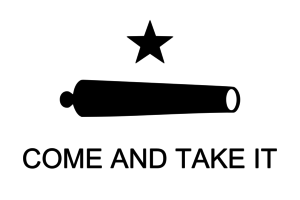 Not a bad design – I wish they had kept it as their state flag, in the mode of Texas. 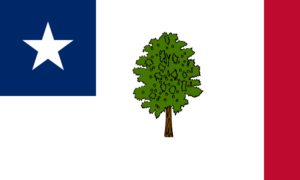 According to Wikipedia, this flag was Mississippi’s official flag from 1861 until 1865; it remained in unofficial use until 1894, when the current state flag was adopted. 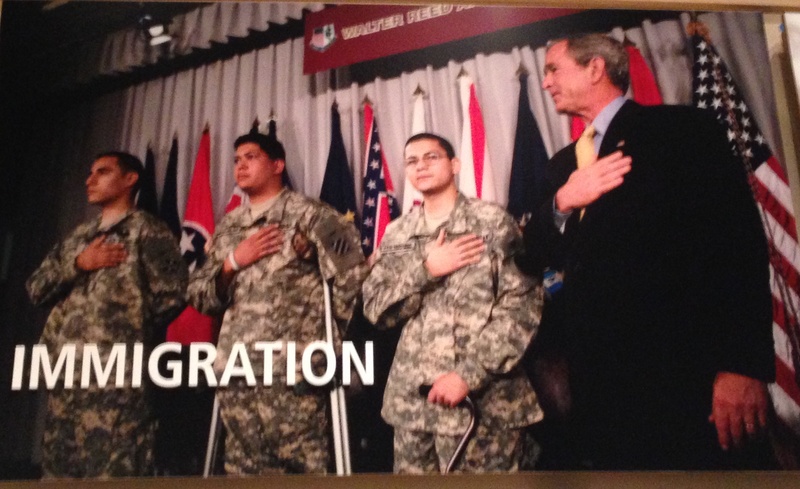 And we all know the problem with the current flag. The Confederate Battle Flag on the canton survived a referendum in 2001, but I would have no problem with the governor changing it by fiat anyway, because Confederate symbols have no place connected to current symbols of sovereignty. 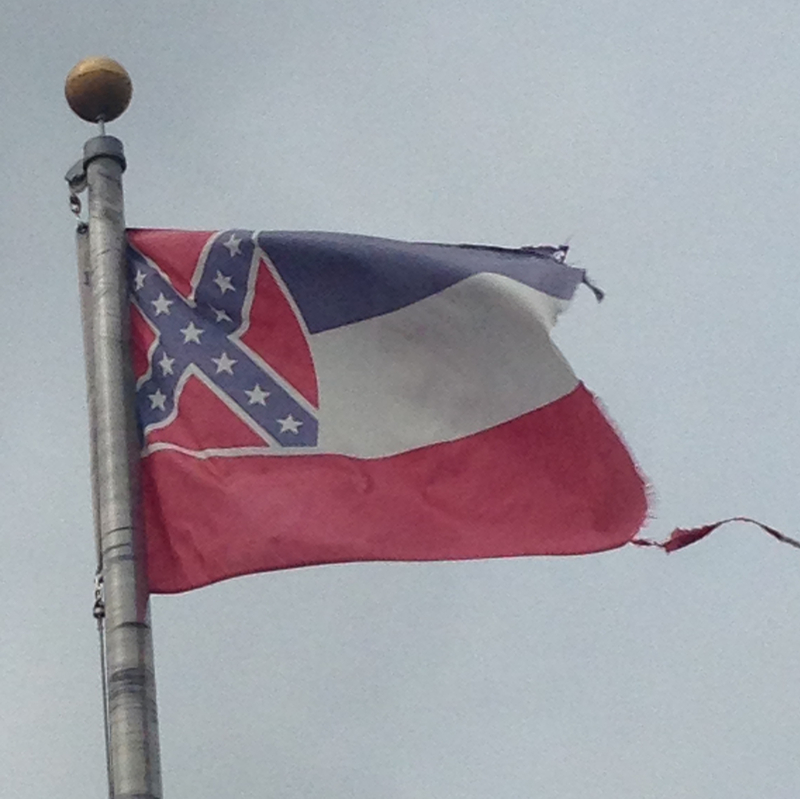 Furthermore, the Confederacy lasted all of four years, was in defense of a horrible cause, and went down in flames. 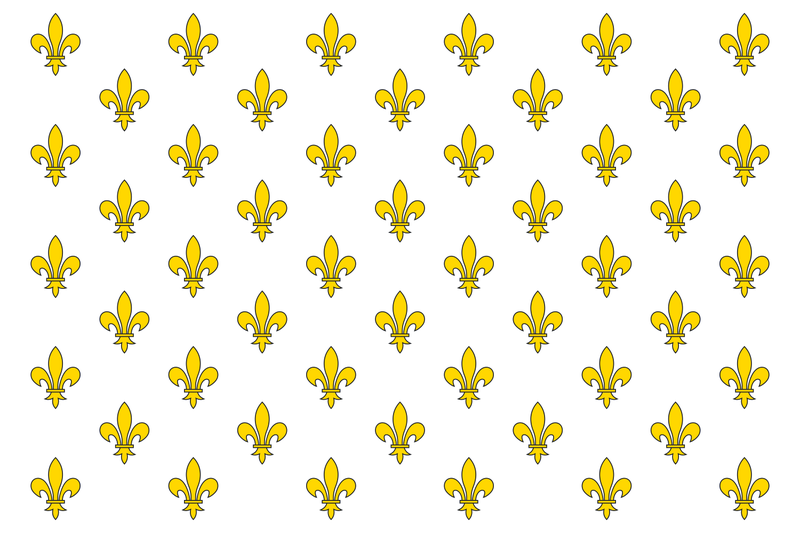 (Why not a canton of the Union Jack, or the Cross of Burgundy? Those were also episodes in Mississippi’s history – and probably happier ones.) The Magnolia Flag is a nice design and especially appropriate to the state: eleven states were in the Confederacy, but there’s only one Magnolia State. 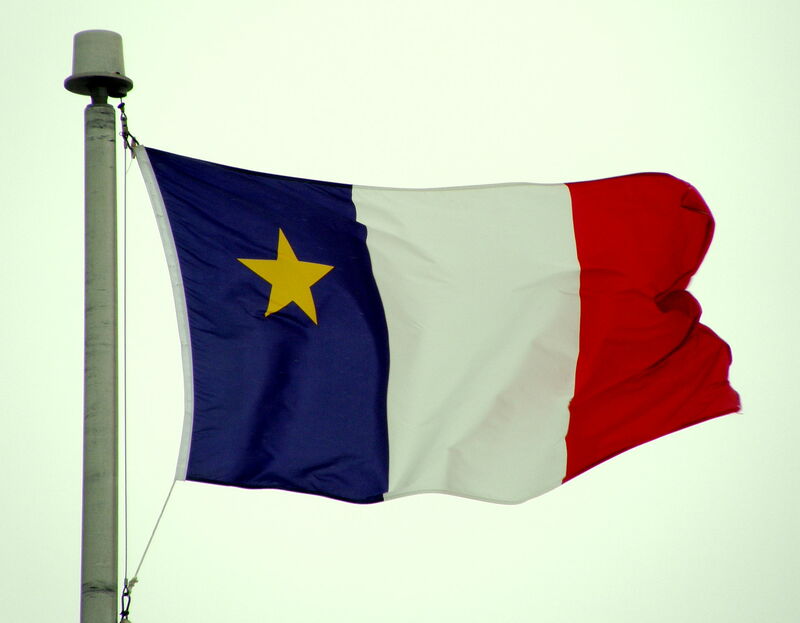 I was pleased to learn about this one, because there is a similar flag in Canada: the flag of Acadia is a French tricolor, defaced with a gold star. 7. 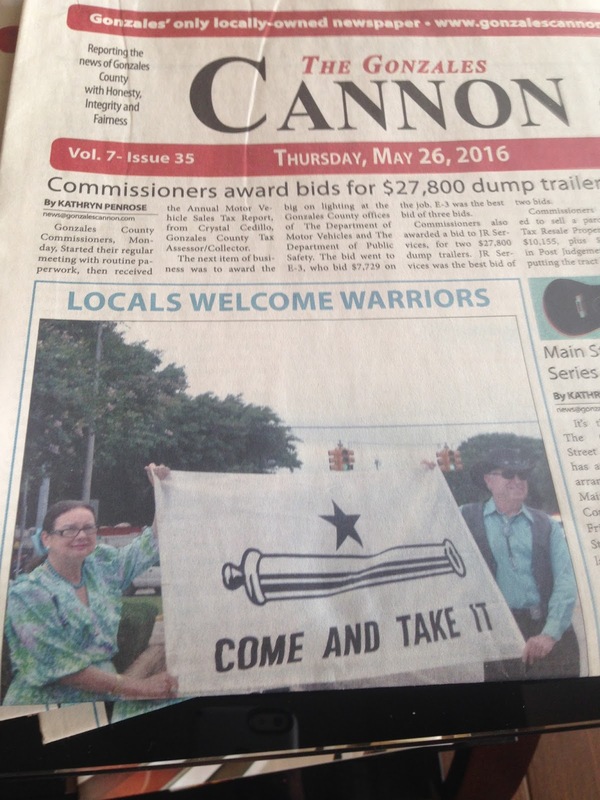 We spent the night in Gonzales, Texas, and thereby discovered the existence of the Gonzales Flag. 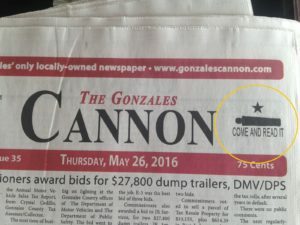 In 1831, the Mexican government had given the residents of Gonzales a cannon for defense. 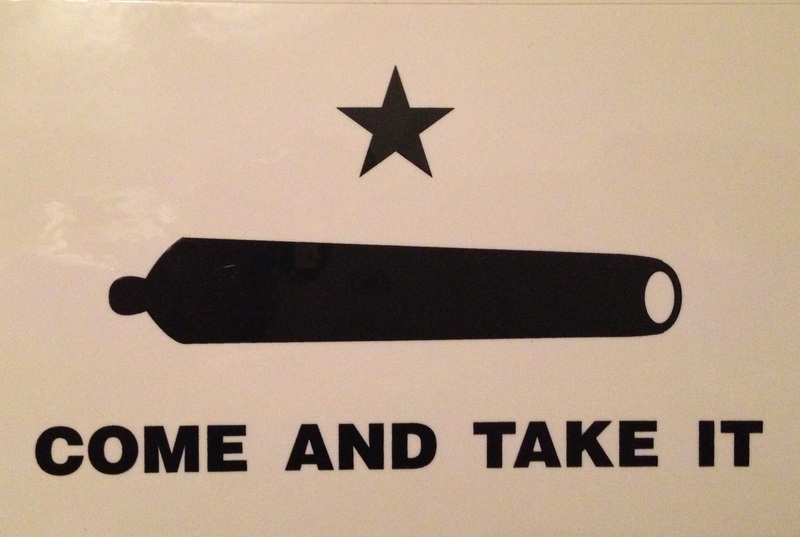 At the outbreak of the Texan Revolution in 1835, however, the Mexicans sent a force to take it back, and the Gonzalans replied with a suitable Laconic phrase, embroidered on an improvised flag. 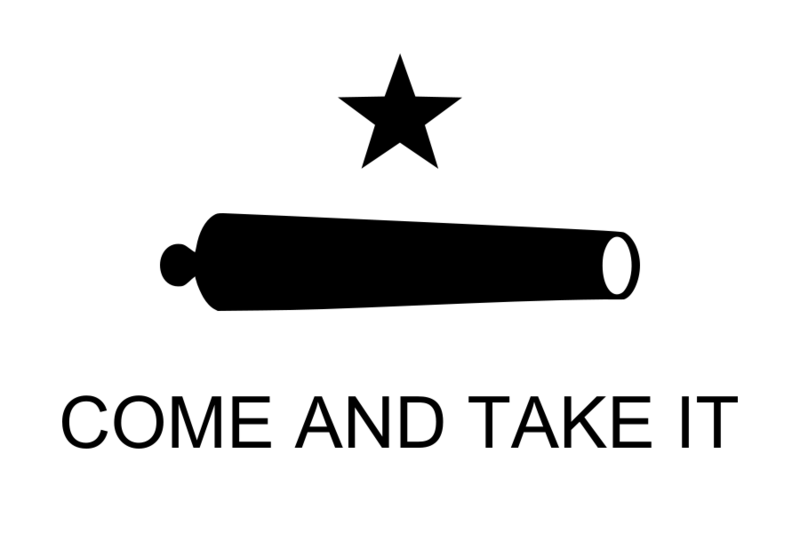 The Battle of Gonzales was the first military engagement in the Revolution, and inspiring for the Texans, as the Mexicans were forced to retreat without their cannon. 8. 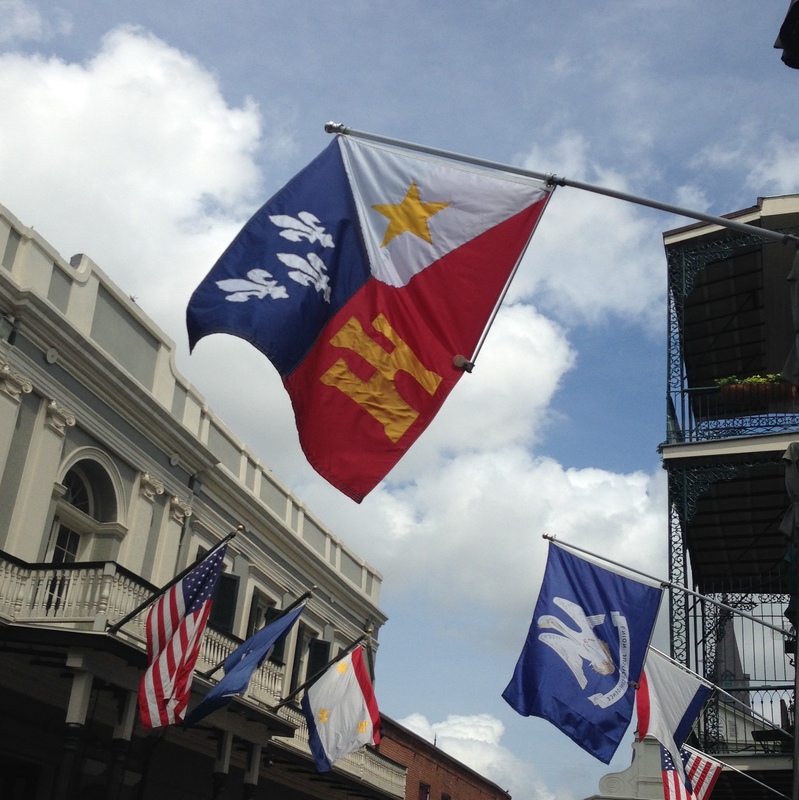 Finally, the Louisiana state history museum exhibits an unofficial flag celebrating Louisiana’s admission as the eighteenth state of the Union in 1810. 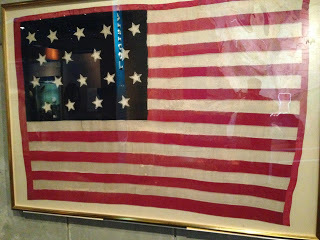 You’ll notice that this flag has eighteen stars – and eighteen stripes! 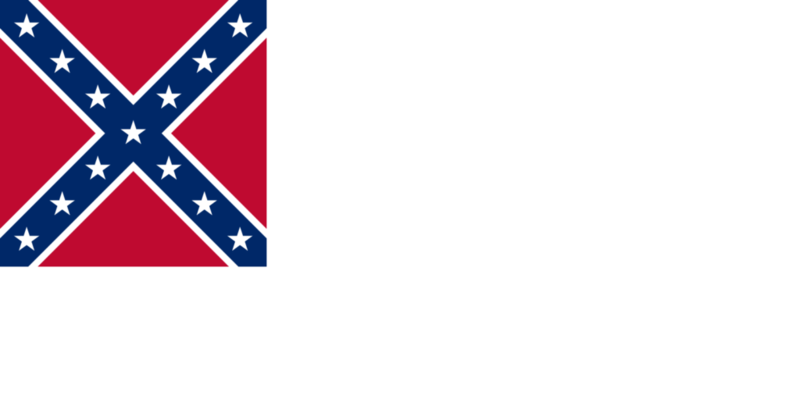 Actually the official flag of the United States stopped with fifteen stars and fifteen stripes when Kentucky was admitted in 1792, but people kept adding both stars and stripes anyway out of pride. 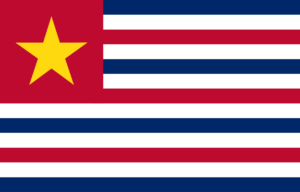 Only in 1818 did official word come down that the number of stripes should revert to thirteen, and the number of stars increase to twenty, for the number of states by that time.